Call this the holy grail of points and miles. Getting to Australia on points is the most commonly sought, most complicated and most frustrating way to use points – like… ever. If you can manage it however, you’ll be rewarded with sheer amazement as you take in Australia, which is without a doubt one of the greatest places on earth. And of course, if you’re already in Australia, just use this information to work backwards! Here’s how to jet set back and forth between the Northern Hemisphere and Australia using the least possible points, with the maximum possible enjoyment. You’ll soon know the seven of the best options for using points. What are you waiting for? Start scrolling! If you’ve already got a boat load of points, that’s fantastic. But if you’re just getting started, the easiest way to successfully use points to Australia is to collect points which can be converted into a variety of different airline miles. The easiest way to do that? Credit cards such as Amex, Citi, Chase or SPG – which offer “flexible”, transferrable points. To break it down: you can convert these points United Airlines miles, just as easily as you could make them into Emirates miles. This is the way to go, because if you only have one type of miles, availability or opportunity may be scarce. If you’ve got 15 options, your potential for finding something great is exponential. Before we get into specific uses of points and examples of which points will help you unlock the best experiences, it’s important to open the brain box. In an ideal world, you’d simply find direct or easy one connection flights in one search. In the real world though, you’ll be lucky to find anything that works! Consider alternate ideas such as booking a ticket using points to Asia, and then a separate ticket using points or cash onward to Australia. Also consider alternate cities. Perhaps Melbourne has no availability but Sydney has lots. Flights between the two are fast and cheap, so it could be a winning move. Getting Them: Alaska’s MileagePlan is a unique frequent flyer program because it allows members to use points on a wide variety of airlines and does not belong to an alliance. You can earn points from the Alaska Airlines Credit Card in the US, from flying on quite a few airlines and via frequent points sales, where first class can be acquired for just $1400! To Australia! 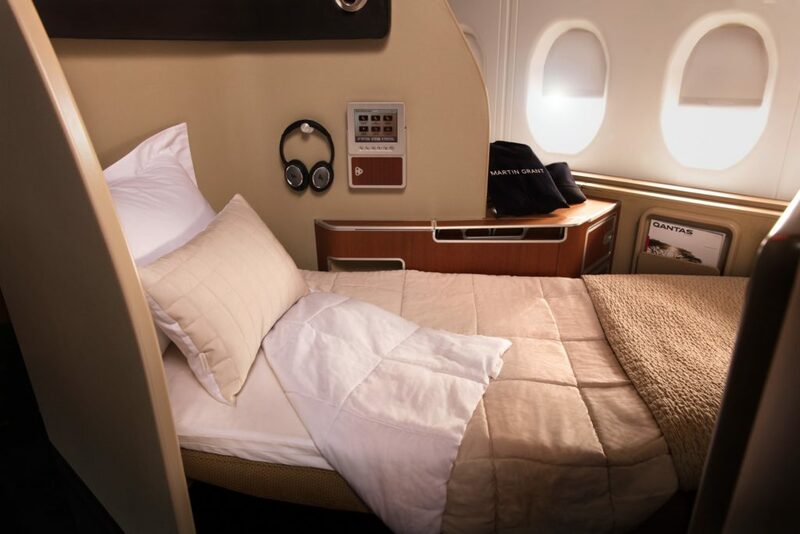 How Many You Need For Business Class: Unfortunately, unlike every other example we’ll list below, this works between the US and Australia, but not Europe and Australia. US to Australia with great airlines like Qantas or Cathay Pacific is just 110,000 points round trip in business and just 140,000 round trip in first class! That’s a shockingly low rate for glamorous first class travel on Qantas. How To Book: Space in business or first can be a bit challenging, but using AsiaMiles.com or British Airways website to search for seats is a great first start. Search segment by segment, like New York to Hong Kong, Hong Kong to Australia to piece the itineraries together. Ignore rates on other sites. You can also set alerts for when seats become available. When you’ve found what you’re looking for, call Alaska Mileage Plan to book. Their agents are lovely. Getting Them: Mileage Club miles are pretty tough to come by, which explains why the rates to spend them are so good. ANA offers a US credit card, transfers from your Amex points and miles can also be accumulated from the SPG credit card or SPG points. You can also earn ANA Mileage Club miles for almost all Star Alliance flight and flights on All Nippon. How Many You Need For Business Class: Just 120,000 points round trip from the US or 136,000 round trip from Europe. First class is roughly 220,000 points round trip. ANA and Star Alliance partners such as EVA Air offer truly excellent business class cabins and are a great choice for travel to Australia. How To Book: The United Airlines website at United.com is the easiest way to find availability. Just ignore the rates charged by United – all you’re looking for is available seats using points by selecting “search for award travel”. With so many Star Alliance airlines in Asia, you’ll have a plethora of choices for combining airlines to find easy availability. Once you find availability call ANA to book. Getting Them: AsiaMiles can be instantly created using Amex, Citi or SPG credit card points. You can also earn AsiaMiles for all flights on OneWorld airlines, like American Airlines, British Airways, Cathay Pacific, Qantas and more. How Many You Need For Business Class: 135,000 points from the US, 160,000 points from Western Europe. Both prices are round trip. One way would require roughly half. These figures are using the OneWorld partner chart, where you use two or more airlines to save miles. How To Book: You can search for flights on AsiaMiles, British Airways or Qantas. These figures are based on distance and not by individual flights, so you can look for interesting routings like Los Angeles to Hong Kong to Melbourne, or London to Tokyo to Sydney. This makes it easier to find available seats. Getting Them: Mileage Bank miles may be procured via the Barclays Arrival Premier credit card, the SPG credit card and also SPG points. Of course, you can also earn JAL miles for flights on OneWorld airlines, like American Airlines, British Airways, Cathay Pacific, Qantas and more. How Many You Need For Business Class: You’ll need just 150,000 miles round trip for business class, with no limit to the amount of stops you make. This figure is based purely on distance, so use the GCMap tool to calculate the total distance of all your flights. You’ll have at least a couple thousand extra miles left over to add a cool side trip. How To Book: You can search for flights on AsiaMiles or British Airways. Ignore the rates on either site, but just look for seats available on the flights you want, in the cabin you want. Remember, you have the entire OneWorld network at your disposal and Emirates and you can build in multiple stopovers. Why not fly to Japan, stopover – carry on to Hong Kong, stopover and then fly to Australia? Getting Them: United offers generous credit card bonuses in the US, often topping out at 70,000 points for a single card. In addition, you can create United MileagePlus miles from Chase Ultimate Rewards Points and also SPG points. Of course you can also earn them from flying on any Star Alliance airlines. How Many You Need For Business Class: 160,000 is the prescribed round trip dosage from Europe or North American to Australia. 80,000 will get you one way on United. First class is 115,000 each way and travel would take place on top airlines like Lufthansa, Thai and more. How To Book: United offers an easy website for searching flights with points. Simply visit United.com and click “search for award travel” when entering your search query. Availability on United can be tricky, but with partners there are a lot of options. Getting Them: American Airlines now offers multiple credit cards, yielding relatively easy potential to score up to 120,000 points without flying, just from two cards. You can learn more about that here. Other than SPG, American does not offer any transfer partners and therefore points come only from their credit card and or flying on OneWorld partner airlines. How Many You Need For Business Class: Leave it to the US airlines to price match each other, almost always, You’ll ned 160,000 round trip from the US or 170,000 from Europe. First Class will run 110,000 points each way, and you can combine business one way and first the other. With partners such as Japan Airlines and Cathay Pacific, there are great options, though stopovers can be tricky. How To Book: You can book many flights online with American, but for some flights it may be easier to book over the phone. We recommend using the AsiaMiles.com website or British Airways website to find seats (ignoring their respective rates using points). If you find seats open in your desired cabin, call American to book. Getting Them: Singapore KrisFlyer miles can be instantly created from every major bank, making them one of the easiest points currencies to use. You can instantly create Singapore miles from: Amex, Citi, Chase and Starwood credit card points. You can also earn Singapore KrisFlyer miles for almost all Star Alliance airline flight. How Many You Need For Business Class: You’ll need between 210,000 – 236,000 depending whether you start in Europe or the US. One way would require exactly half. You could use far fewer miles if you only want to reach Asia, and then book a separate ticket onward. How To Book: Singapore doesn’t offer seats using points in business class to partner airlines, so you’ll need to book directly on SingaporeAir.com and find availability there as well. If you’ve got a whole lot of miles, why not stretch for suites class? It’s incredible! How are you getting to Australia? Previous ArticleNow Is The Perfect Time To Status Match To Alaska Airlines..
Not sure if it was intentional or not, but does Delta nor SkyTeam not fly to Australia? Yeah, the seats are usually unicorns but not much more than the other carriers. Using SkyMiles to reach LAX and/or SEA can get one in reach of the other carriers who are likely easier to use, especially LAX. Hey Geoff, I tried to go by best rates in miles. Delta’s devaluations and stealth devaluations have made it virtually impossible to find anything at 175,000 round trip. I think in relative terms, the ease of acquiring SQ miles makes it a more valid choice than Delta. Perhaps FlyingBlue or Korean offers a decent shot, but I’d take my chances with these first. Just my two cents. Just the post I needed! Actually weighing my options for a LHR to Oz trip for dec.
First choice is paid J companion fare with QR (fingers crossed) from ARN. If not, then miles to Asia and paid onward seems like my best bet. I have to book 3 tickets. Yeah. Miles, 3 tickets and J – not the easiest. For the North American travelers, AA doesn’t allow routing through Asia for a single North America-South Pacific award, would have to be 2 awards if using CX or JL. For UA, partner awards would be 180k for roundtrip business class. ANA Mileage Club miles can be transferred in from Amex Membership Rewards (at least US Amex). They do tend to have heavy fuel surcharges on many partners. Also, Alaska charges 120k in business and 160k in first roundtrip if you use CX to Australia/NZ. And their generous stopover in each direction is a nice feature too. With the limitation of only using one partner (plus Alaska if you like) per one way award. I flew UA on a 787-9 last May, MEL to LAX (and on to SEA) business for 70K (I see it’s gone up to 80K). Lovely flight, lovely airplane, almost all attendants quite pleasant. It’s an odd flight, though – board about 9 or 10 AM (we had a bit of a delay), eat dinner, go to sleep (worked fine for me since I was still jet-lagged, coming in from Africa a couple days before), breakfast and deplane. I like the UA pajamas. Usually I like to check out the wine/champagne menu, but not this flight. Amazing to watch the flight path, bright blue almost the whole way. The Pacific is a big, big, ocean!